Directorate of Teacher Education & SCERT Odisha is going to conduct Junior Science and Mathematics Olympiad (JSMO), 2016-17 Examination on 18th December, 2016. The following is detailed syllabus & Time Table for Junior Science and Mathematics Olympiad, 2016-17. 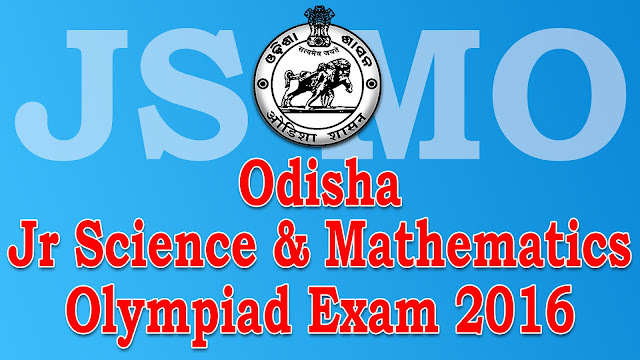 Syllabus for Science and Mathematics Olympiad is broadly equivalent tor Class - VIII and IX Science and Mathematics syllabus of Board of Secondary Education. There will be 100 multiple choice questions each with four options. Each correct answer will be awarded one mark and there will be no minus marking for wrong answer. The examination will be .conducted on 18.12.2016 (Sunday) from 11.00 a.m. to 01.00 p.m. Admit Card will be issued by the District Education Officer to each eligible student prior to Examination from 15 .12.2016 to 17.12.2016.
when will be the results published? please do notify me!